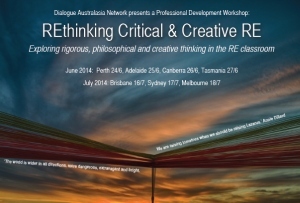 Dialogue Australia Network will conduct workshops on Rethinking Religious Education for RE Teachers in all capital cities. This is a professional development seminar for RE Teachers.. Encouraging rigorous, philosophical and creative thinking in the RE Classroom. Brian Poxon, Head of Philosophical, Religious and Ethical Perspectives at Wesley College, Perth, will conduct day long professional development seminars in all capital cities in June-August 2014. $140/person or $120/person for DAN members and if 2 or more teachers attend from the same school. Cost includes Workshop & Teaching Materials, Morning Tea and Lunch.